The AAPS University of Southern California (USC) Student Chapter was established in 1996 by graduate students Neil Mathias, Wilson Meng, and Silvia da Costa in the Department of Pharmaceutical Sciences, which was recently renamed the Department of Pharmacology and Pharmaceutical Sciences, at the University of Southern California School of Pharmacy. The USC Student Chapter was one of the only four student organizations within AAPS in 1996. While its chapter members have continued to uphold the chapter's reputation for active involvement in speaker programs, social events, and networking, AAPS USC Student Chapter's main pride lies in the success of its annual "Moving Targets" multidisciplinary symposium. 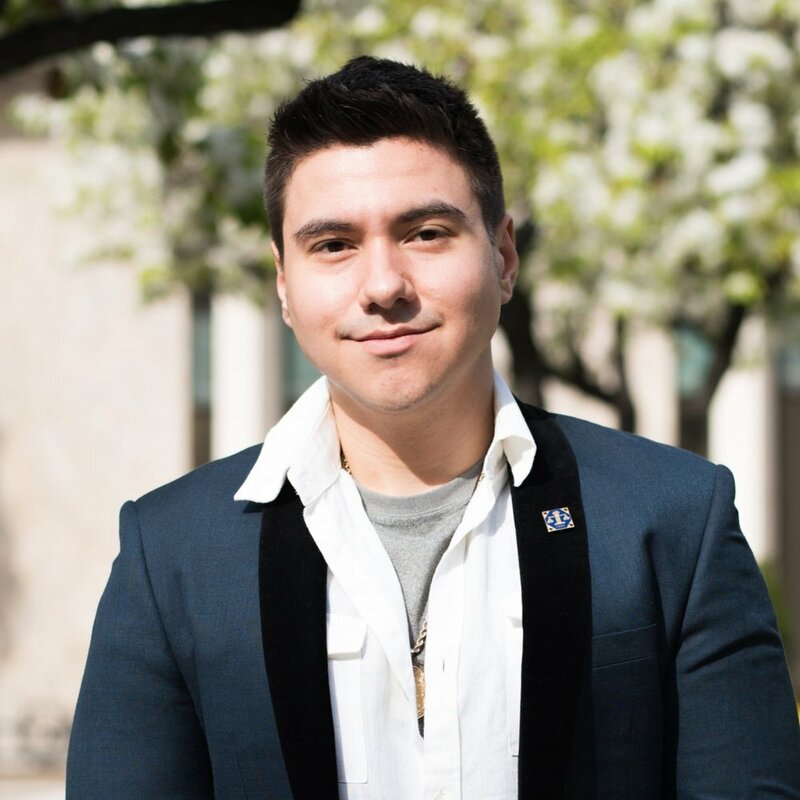 Larry Rodriguez is a 2nd year PhD student in the Pharmacology and Pharmaceutical Science program. In 2013, he was an Ecological Genomics fellow at Kansas State University. In 2014, he was inducted into the ACS Scholars Program. He has earned BSc degrees in Chemistry, Biology, and Biochemistry from Kansas State University (2015). He is studying molecular signaling interactions between neurotransmitter receptors using in vitro and in vivo electrophysiology techniques. Pooja Vaikari received her Master’s degree in Molecular Microbiology and Immunology from the Keck School of Medicine at USC in 2014 and is currently a second year Ph.D. student in the Molecular Pharmacology and Toxicology program. She joined Dr.Houda Alachkar's lab and is studying therapeutic targets for Acute Myeloid Leukemia. Santosh is a first-year graduate student in the Pharmaceutical and Translational Sciences program. He obtained a Bachelor's degree in Pharmacy from Birla Institute of Technology and Science, India before joining Dr. Andrew Mackay's lab at USC. He is currently developing protein-based nanostructures for anti-cancer drug delivery. Aida is a Ph.D. candidate in the Pharmacology and Pharmaceutical Sciences program. She completed her Bachelor's degree in Psychobiology at UCLA in 2009. Upon graduation, she joined USC's Molecular Imaging Center as a laboratory technician, where she worked on development of novel PET radiotracers for imaging in oncology. She is currently in Dr. Andrew MacKay's laboratory working on development of immunotherapies for treatment of Non-Hodgkin's lymphoma. Albert Lam is a 3rd year PhD student in the Pharmacology and Pharmaceutical Sciences program. He graduated from UCLA with a B.S. in Microbiology, Immunology, and Molecular Genetics (MIMG) in 2013. After a year of studying metabolic engineering, he joined USC through the Programs in Biomedical and Biological Sciences in 2014. Albert joined the lab of Yong (Tiger) Zhang in 2015 and is studying the structure-activity relationship of enzymes that catalyze post-translational modifications and their substrates. Houda Alachkar received her Ph.D. in Biomedical Sciences from the Ohio State University in 2012 and received a PharmD degree from Ohio Northern University. She completed a fellowship in Clinical Pharmacology and Pharmacogenomics at the University of Chicago before she joined the University of Southern California (USC) School of Pharmacy as an Assistant Professor in 2015. Dr. Alachkar's translational research focuses on experimental therapeutics and pharmacogenomics, particularly in acute leukemia.